The final day of the Celebrating Excellence Event in SSCs showcased the top projects undertaken by third year medical students at Cardiff University. The standard of presentations was exceptional and all 12 students received a certificate and Amazon gift voucher. The Director’s runner up book prize was awarded to Emeka Ezeigwe. The Student’s £50 prize was Isaac Meyers. Well done to all students for showcasing the outstanding work ongoing in Cardiff. 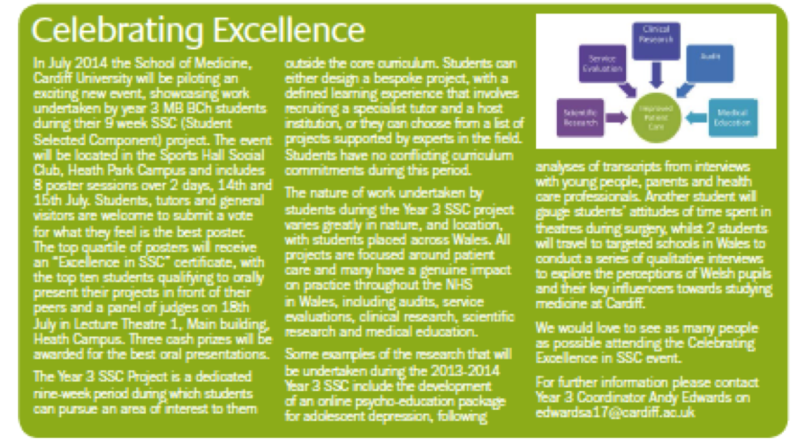 This entry was posted in Cardiff University Staff, Cardiff University Students and tagged Celebrating Excellence Event, SSCs on September 4, 2014 by Sam Hibbitts. We hosted the first Celebrating Excellence Event in SSCs for year 3 medical students over two days: 14th and 15th July. There were 8 sessions in total and the standard of presentations was excellent. Students demonstrated a great depth of work in a whole range of areas with many important findings that have the potential for publication and changes in clinical practice. Thank you to all students who engaged fully with this event and all supporting academics and visitors who came to see the work our medical students have completed during their SSC period. The 12 posters with the highest percentage of votes from their sessions have qualified for the oral presentation session. All are welcome and we look forward to seeing you there for what promises to be an excellent final day. 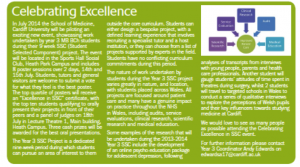 This entry was posted in Cardiff University Staff, Cardiff University Students, Year 3 SSC and tagged Celebrating Excellence Event on July 16, 2014 by Sam Hibbitts. Next week we are hosting the 1st annual SSC Celebrating Excellence Conference at UHW. 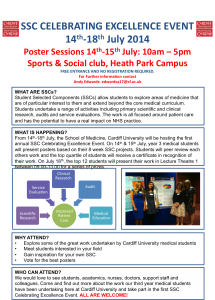 Throughout Monday and Tuesday all year 3 medical students will present a poster on their recently completed 8 week SSC project and students from all years are welcome to attend. 1st and 2nd years who are still around are particularly encouraged to come along as it will be a great opportunity to gain inspiration for your own year 3 SSC, when you can design your own project, which includes choosing your tutor and location. The event is in the Sports and Social Club and will run from 10am-1pm & 2pm-5pm each day. This entry was posted in Year 3 SSC and tagged C21, Celebrating Excellence Event, SSCs on July 10, 2014 by Sam Hibbitts. Plans for the Celebrating Excellence event in July are on going with local advertisement in this months edition of reMEDy. This entry was posted in Progress Updates, Year 3 SSC and tagged Celebrating Excellence Event, reMEDy on June 9, 2014 by Sam Hibbitts.